Le Multicolore game is derived from classic roulette and is also the game of chance where you can gain monetary rewards and have a very nice pastime. It combines the peculiarities of 2 totally different games: gambling roulette game and billiard. It is very exciting and lures players with quite unusual gameplay. Imagine a large table with the roulette disc on one end. The roulette wheel layout consists of 25 cups of the equal size. The "multicolored name" of the game is given due to various colors on the roulette disc: 6 red, 6 yellow, 6 white cups and 1 blue cup. Each segment has its own number: the blue area is numbered 24, one area is marked with 4, two segments are marked with 2 and three segments are marked with 3. Mentioned above numbers determine the payouts which are paid correspondently to the numerals assigned to the cups: 4 - 1, 3 - 1, 2 - 1 & 24 - 1. So how is the winning number identified? The procedure is almost the same as in classic roulette. Using a cue stick the croupier strikes the ball to the gaming zone. When the ball eventually reaches the wheel, it comes down in one of the cups. Thus is how gamers identify the winning number. By the way the roulette wheel itself may remain static or spin. The table in this French roulette variation is painted with the same colors (red, green, yellow, white and blue) where players can place their bets. Basically the idea to introduce Le Multicolore to public belongs to Raymond Poincare who was the French president from 1913 to 1920. His aim was to replace the gambling game of roulette as well as billiard something else. And he managed to realize own dream. Le Multicolore has only 25 cups contrary to 37 or 38. Oppositely to red and black colors which are typical for classic roulette games, there are five bright colors. It seems to be absolutely different game at first sight. 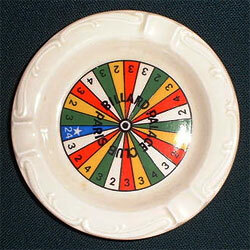 Le Multicolore variation of roulette can be played and enjoyed in France. This particular roulette alternative is also enjoyed where traditional roulette gambling games are not allowed. It can be bought and played at home as well. What is your favorite roulette game? Along with standard roulette variations one can enjoy roulette games for fun.